Anyone who’s ever used a hot pack to warm up a sore muscle before a sporting or exercise activity probably knows that heat helps to reduce muscle stiffness and increase blood flow. Find out more on how infrared heat can help to improve your health and treat a wide range of conditions below. Each of these has a different range of wavelengths, which supports its wide range of applications and medical uses. IR is also able to penetrate human tissue more effectively than normal heat. The delivery of infrared light makes use of simple lamps, which are designed to emit penetrative IR radiation, usually above 700 nm. These devices can also emit some specific ranges within the IR spectrum, though these are far less common due to their high costs. 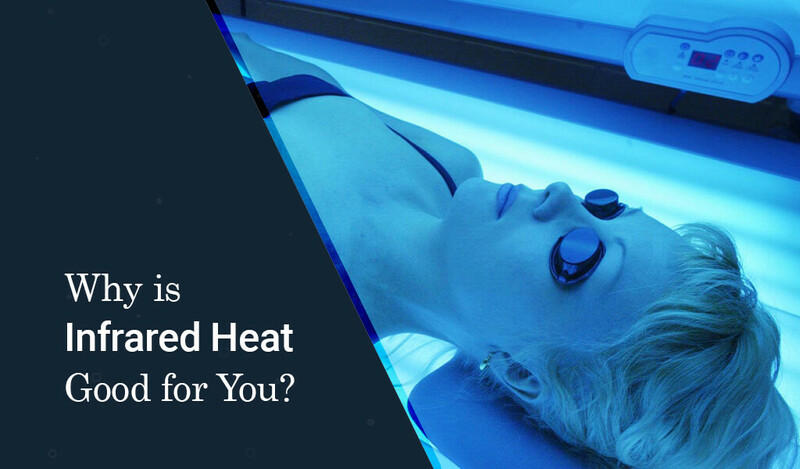 Smaller infrared devices and infrared saunas use these lamps and infrared lasers to deliver infrared heat to the entire body surface, or specific area. The IR emitting substances can also be used by integrating them with devices or fabrics for long-term continuous delivery. Infrared is a non-ionizing form of radiation, unlike the radiation from sources such as x-rays and far ultraviolet radiation, which is ionizing and can damage the DNA with exposure. The main effect that infrared radiation has on any biological tissue is increasing the temperature of the target area. This has a similar effect as using a simple hot press, and can, therefore, be used to relieve a variety of symptoms. Infrared can also have non-heating interaction with body tissue. This generally involves some specific structures or molecules within the body absorbing the infrared radiation. The result is that the structure is activated, excited, or altered in shape. Infrared can also be used to enable various biomedical devices (like biopolymers) to release a substance or drug to the target area or interact with the surrounding tissue. Infrared is so safe that it has often been used in hospitals to keep newborn babies warm. Plus, Infrared devices and infrared saunas have been studied and researched for decades. Physical therapists, chiropractors, and doctors use infrared every day in hospitals and clinics around the world to heal skin conditions, ameliorate pain, increase flexibility and range of motion of joints, and help heal the body. Due to how deep the heat penetrates, infrared radiation therapy can be quite effective in reducing inflammation. In a study of 37 arthritis patients, infrared pulsed devices were shown to reduce inflammatory cytokines. The patients showed a definite improvement if both pain and function after only a few months. Another important factor in inflammation is vessel permeability. The increased permeability allows more fluid to flow out of the blood vessel and get deposited onto the tissue, which in turn increases inflammation. Infrared devices are effective in the treatment or arthritic joints, thanks to how close they are to the skin. This allows arthritic patients to minimize their reliance on the standard clinical treatment options and the nonsteroidal anti-inflammatory drugs. In another study, infrared treatment was shown to significantly increase mobility in rats with artificially induced arthritis, by decreasing vessel permeability and reducing inflammatory cytokines. Infrared radiation can help to shorten recovery periods and reduce the soreness or inflammation that results from post-exercise recovery. This allows for more frequent and intense training and overall improved results. The heat helps to relieve muscle stiffness and soreness by increasing blood circulation. The deep penetration of infrared heat helps to relax muscles and allows for the metabolic waste products to be carried off these muscles while delivering oxygen-rich blood for a faster recovery. It also helps to warm up the muscles for greater flexibility and broader range of motion, while relieving tension and pain. Besides heating deeper into the muscles, infrared heat also promotes the release of nitric oxide. Nitric Oxide helps to improve circulation and increases the number of nutrients and oxygen coming to help heal an injured area. For a specific injury, such as a strained hamstring, physical therapists often use an infrared heat device to help with the treatment. As mentioned earlier, heat helps to increase blood circulation within the body. The deep penetration of infrared heat helps to not only improve circulation but also stimulate the sweat glands, which in turns encourages the release of built-up toxins in the body. Regular sweating from an infrared sauna or device will help to detoxify your body, by releasing the accumulated heavy metals, nicotine, alcohol, and other toxins. It’s actually a well-known fact that sweating is an effective way of getting rid of stored toxins in the body. Infrared radiation heat has been shown to increase the rate at which skin wounds heal. In one study, far infrared rays increased the key factors (e.g., TGF – ß1) in the healing process and the activity of connective tissues (fibroblasts) and other reparative cell types. Increased levels of TGF – ß1 reduces the production of inflammatory factors, which in turn shortens the inflammatory response period, thereby allowing for the wound healing process to move on to the proliferative phase much quicker. Moreover, infrared light increases the formation of connective tissue and the production of collagen. One study demonstrated an increase of epithelial cell growth by up to 171% after exposure to near-infrared light therapy. According to an article in the Journal of the American Medical Association, regular use of an infrared sauna has a similar boost to the cardiovascular system as running. In the infrared heat, the body is pumping more blood, producing sweat, and burning calories in the process. This effect is referred to as “passive aerobic workout” since the body is getting all of the benefits while not being stressed as it would have in a typical workout. The body is actually more relaxed, and during that time, it’s in a parasympathetic mode. As the body produces more sweat to cool itself, the heart is working harder to pump blood. This boosts circulation, increases metabolism, and burns calories. In fact, a 30-minute infrared sauna session will burn anywhere between 300 to 800 calories. In a study examining 10 diabetic patients (Type II), infrared therapy was shown to lower blood glucose levels significantly. Although these patients weren’t able to regulate their sugar levels using diabetic medication, infrared radiation therapy did so by lowering their insulin resistance and reducing their cortisol levels. In another separate study of 15 type II patients (middle-aged), 3 months of far infrared therapy in a sauna was shown to improve their quality of life. The patients also reported improved emotional and physical health. One week of infrared therapy was shown to heal diabetic foot ulcers in a study of 50 diabetic participants. After a month, the ulcers shrank in size and produced fewer secretions. The infrared lamp was also shown to help prevent infection. Infrared radiation therapy is one of the most effective, versatile, and pleasant natural treatments available today. Every now and then, the scientific community gives us more insight into the amazing health benefits and uses of IR heat. Be sure to use the comment section to let us know of any questions, concerns, and recommendations you might have. We’d love to hear from you.